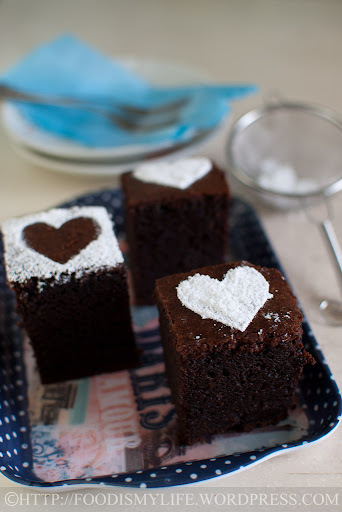 Icing sugar can really make a slice of cake look pretty! I had baked a Baileys Chocolate Cake before – it requires the creaming of butter and sugar then the eggs are added and then the Baileys, alternate with dry ingredients are added. I remembered the cake to be a bit dense and pretty rich (pardon my memory, the last time I baked this was in 2009!) So, I was looking for a cake that would be lighter in texture and less chocolatey (I don’t want the chocolate to overwhelm the Baileys). 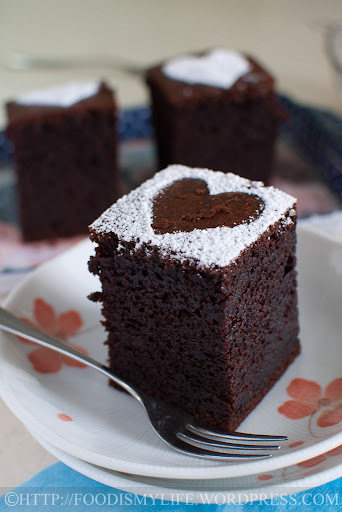 That’s when I stumbled upon a Chocolate Guiness Cake recipe on Bakersroyale – after reading the recipe, I decided to substitute the Guiness with Baileys – and the resulting cake was so delicious! 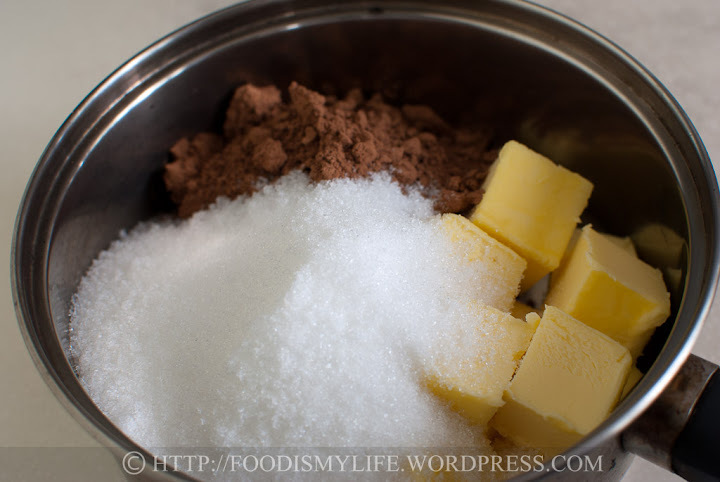 Cast of ingredients: Cocoa powder, butter, Baileys, eggs, coffee powder (to make the coffee), sugar, vanilla extract, flour, baking soda, and the always-missing salt. 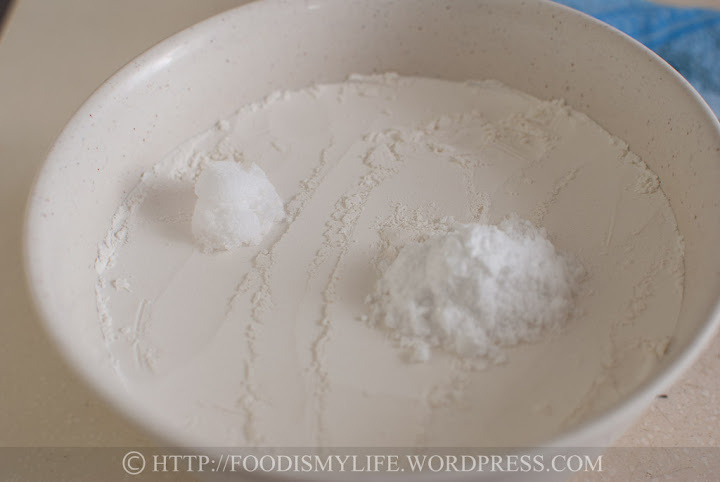 Flour, baking soda and salt in a bowl. 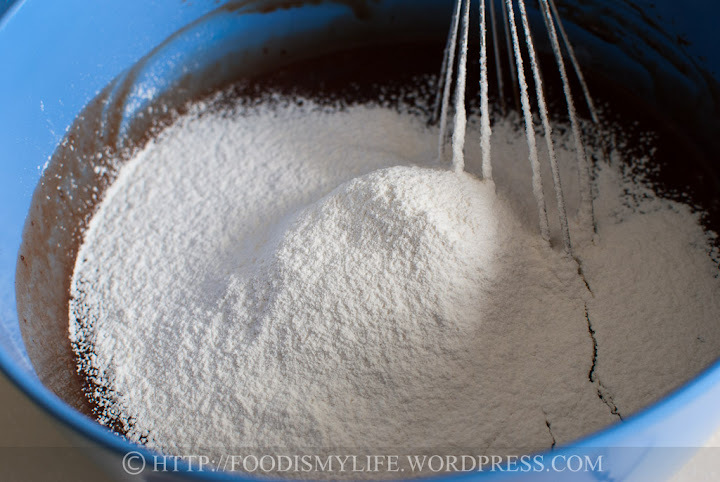 Whisk to distribute the baking soda and salt evenly. 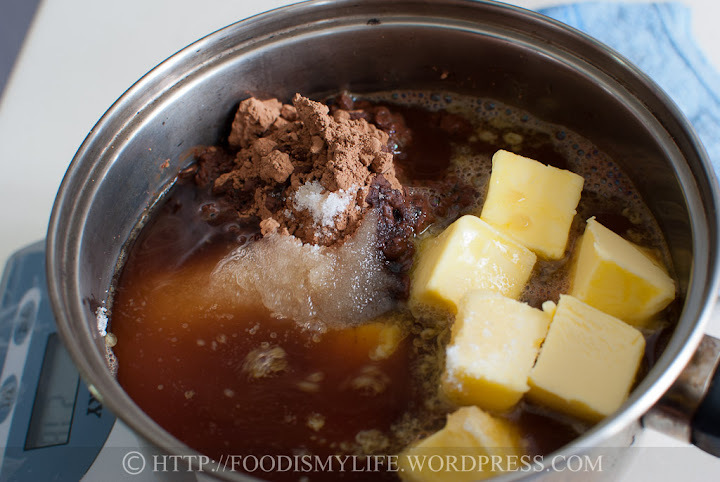 Cocoa powder, sugar and butter in a pot. 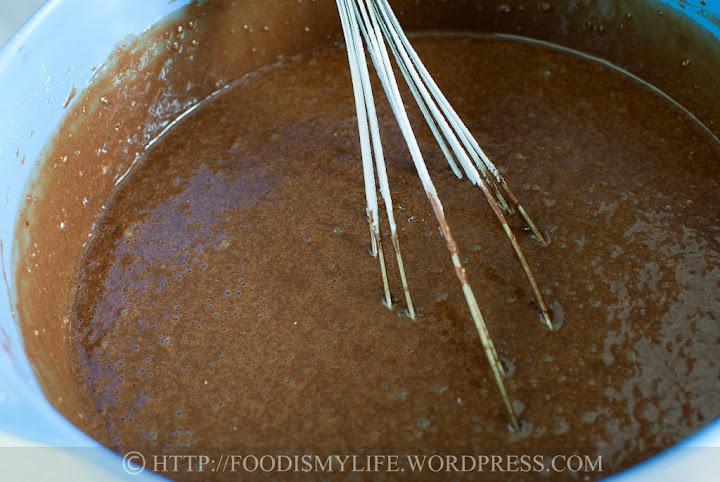 Add in the coffee – mine was still warm, so it’s already started to dissolve the sugar! Then whisk in the flour mixture. Preheat the oven to 160 degrees Celsius. Butter a 8 x 8 x 3 inch tin and line the bottom with baking parchment / paper. Set aside. 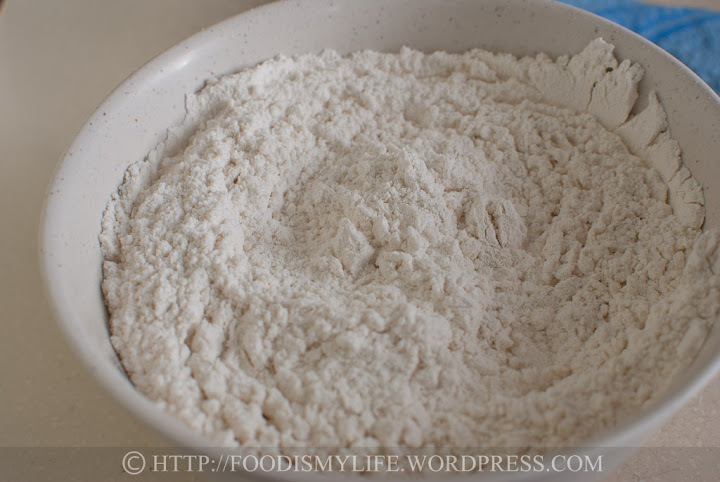 Sift in the flour mixture and whisk in gently until all the flour has been incorporated. The cake batter will be thin (very liquidy) and bubbly (because of the reaction between the baking soda and the cocoa powder). 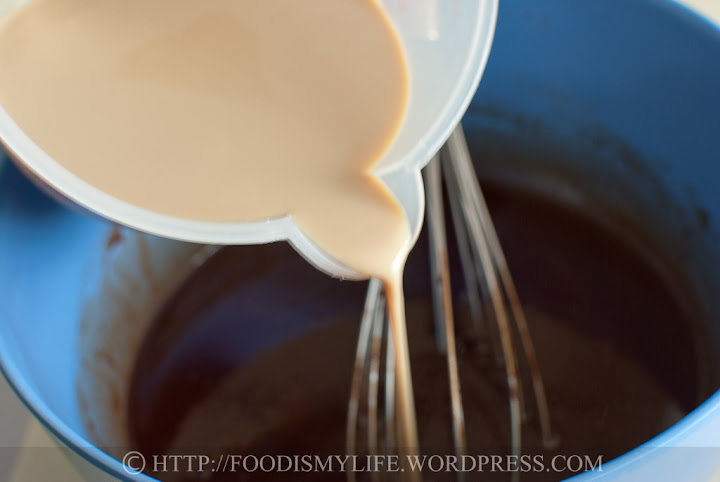 Pour the cake batter into the prepared tin. Lift up the tin and drop it on the table counter-top gently 3 to 5 times to remove excess air bubbles. Bake the cake for 1h. Cover the top of the cake with aluminum foil and continue baking for 30 minutes until a skewer inserted into the centre of the cake come out with very little crumbs.Place the cake tin on a wire rack and let it cool completely. 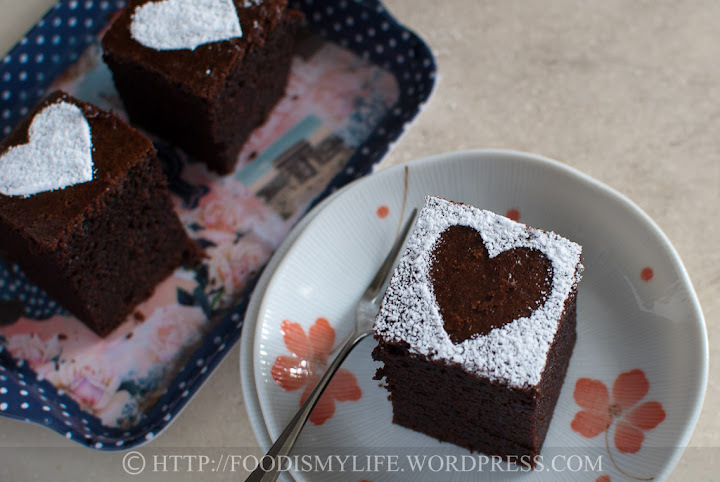 Slice, dust with icing sugar, and serve! 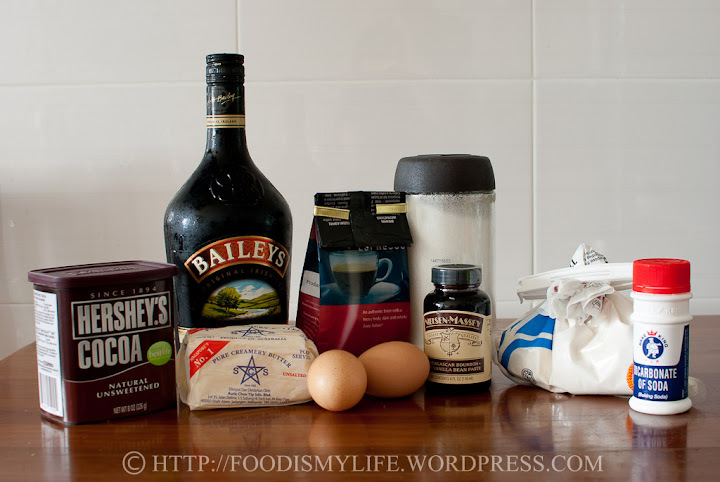 I made my own version of Irish cake bombs… will blog about it soon! Hi!! This looks so good I can’t wait to make it!! But I would like to ask what kind of brand of coffee you use for this, thank you!! This is just the recipe I was looking for. Thank you so much. I am going to try it right now! I wanted to try a recipe from a fellow food blogger Got Bailey’s will bake. Hmmm I think you can try baking the cake for 45 minutes, then cover with foil and bake for another 45 minutes. This would probably prevent the top from getting over-baked and harden. I’ve not tried making a “virgin” cake, but I think you can try substituting with milk as Baileys is a milk-based drink and has similar consistency as milk. I think buttermilk may work well here too, but it may affect the rise of the cake (buttermilk will react with the baking soda). Sour cream would be too thick, so I don’t think it’s suitable. Hope it helps, and let me know if you baked one without Baileys! 🙂 Have a great day ahead! I must say the cake taste awesome. Brought it for my mums group, They absolutely loved it. I baked it at 160C for 30 mins then cover with foil for 30 mins, then bake without the foil for another 20 mins. Altho the top was a little hard at first, this morning it was crispy. Absolutely divine. Hi Jacqui, sorry to hear about your cake! 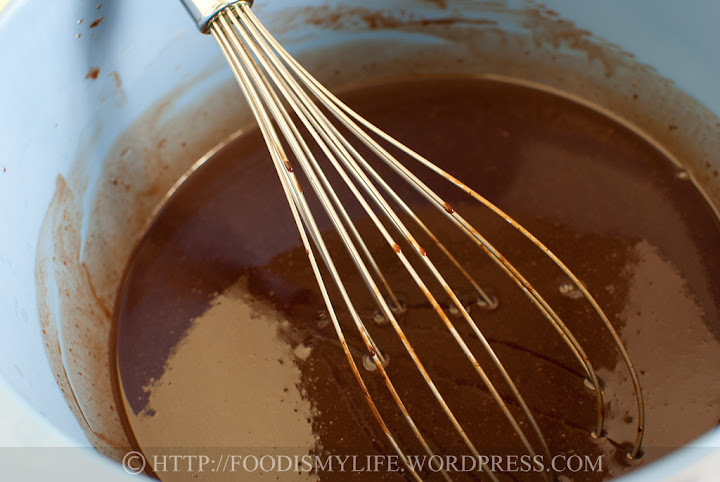 It’s a very liquid batter so it really need quite some time in the oven for it to be baked. After baking for 1 hour at 160 degrees, did u cover it with aluminum foil and bake it again for another 30 minutes? Please advise. Have yet to bite into it. Love the smell of Baileys. Wow! Incredible presentation alone, let alone the cake probably tasting amazing! Thanks for sharing, Jasline. Can’t wait to try the baileys cake! Aww thank you Sasha! I am so glad the cake turned out perfect for you! A very happy birthday to your mom! Have a great week ahead, take care! I´m not a Guinness fan but I am a Baileys fan – and htis looks and sounds amazing. 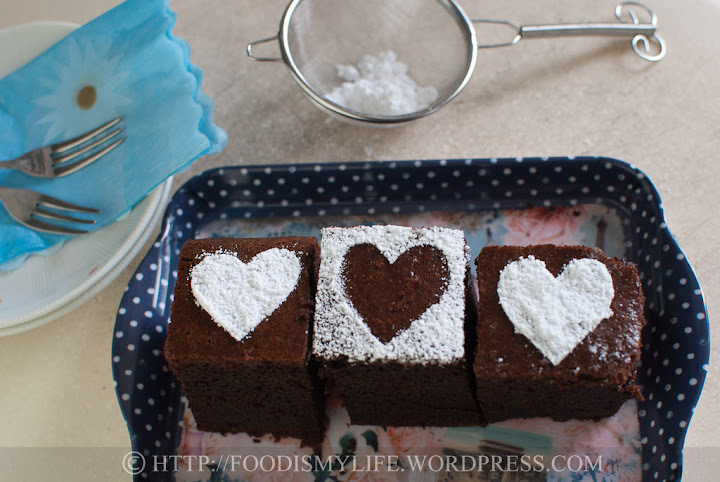 Love those icing sugar hearts! Hi Bee, I’m so glad the cake turned out perfect for you! (: take care! Baked this today for St. Patricks Day and it turned out perfect! I subbed applesauce for the butter and baked it in my dutch oven. My husband said this was the best cake he’s ever eaten. Thanks so much for the recipe! I’ll be featuring this on my blog sometime in the near future. A dessert for chocolate lovers. Beautiful. 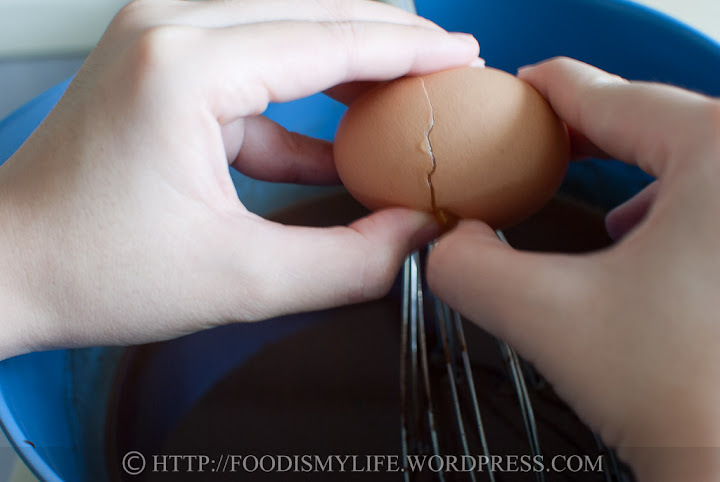 Thanks for linking it to Bake with Bizzy. Thank you Lena! I don’t like the taste of Guinness… I was worried that nobody will want to eat the cake and I myself wouldn’t like it! Will need to find a Guinness lover before I bake this cake… (: It’s just plain black coffee, the coffee taste is not strong at all.. I wonder why too, but at least it has a nice Baileys aroma and taste! You’re welcome. Oooh shamrocks will look so pretty too! Happy St. Patrick’s Day in advance! You’re welcome, do try it! I feel like making it again this weekend! i can imagine how delicious this is with the combination of baileys and coffee. But i wonder how does it taste with guiness..hmm..maybe slightly bitterish..btw, is that plain black coffee that you added in or it’s added with milk? Thank you Bobbi (: Aww that’s too bad for your boy… but I like the idea of “more for myself’! 😉 Take care! Aww thanks! (: Glad the icing sugar did the trick! Thank you! Do give it a try and taste for yourself! It’s irresistible! Mmmm… that’s a wonderful suggestion! I’m gonna make a Baileys syrup for this cake the next time! This looks irresistible! 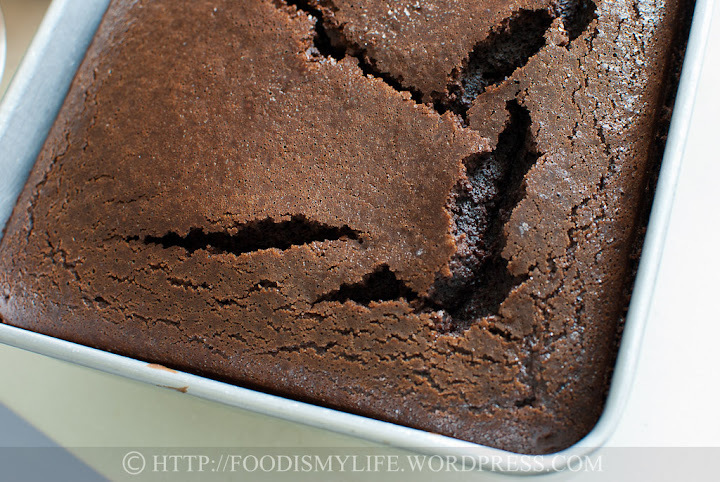 Moist, chocolaty and delicious! 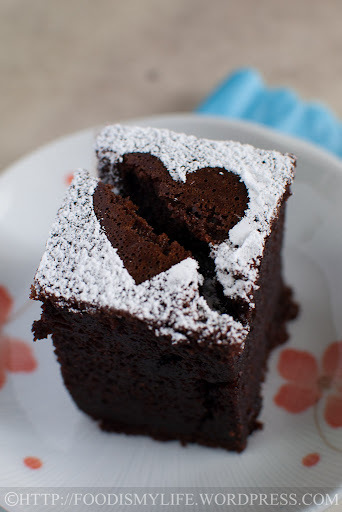 Looks like a sinfully good cake! I like that you decided to decorate (even) the broken hearts!!! The cake looks great! Love the decorations with the icing sugar! You had me at ‘lazy person cake’ 🙂 I adore Baileys and especially in a dessert. Bring it on!